People love information, so much so that the great minds and the powers that be created the massive information conduit we all know as the Internet. Gone are the days of carrier pigeons and smoke signals. Need to look up your favorite recipe or harass your BFF, just whip out the Phablet, ultrabook or the smart [insert device name here]. Today’s world is really a connected one. With WiFi now available everywhere from cars to planes you have no reason not to be online. I’m sure if you’re here reading this you probably already know what a router is, but… just in case you don’t or maybe need a better understanding of what it actually does. A router is a device that sits on the edge of your network, it does as its name suggests which is route information to devices on your network, modern consumer routers actually combine a few different devices into one. There is the routing section which takes the data from your modem which could be either cable or DSL, the built-in switch for you to connect your LAN cables to and the antennas or access points which provide the basis for the WiFi connections we love so much. 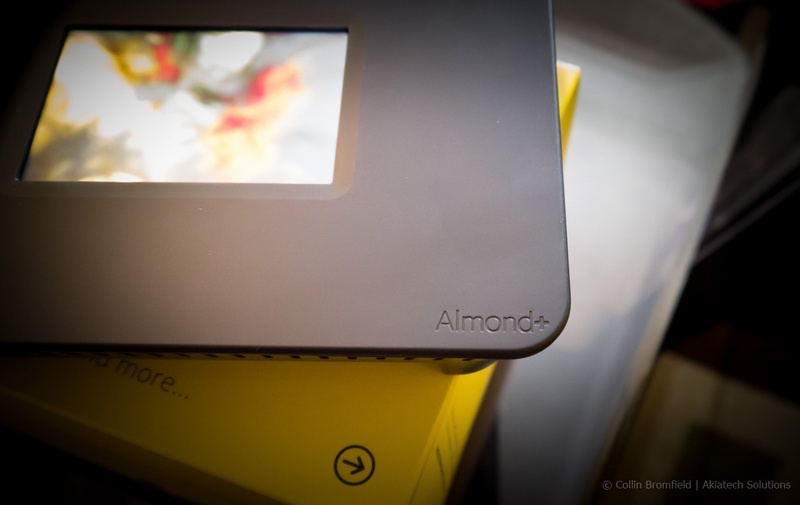 So now that we all know what a router does, I’ll introduce the subject of this long-winded post, the cutting edge Almond+ router from a little company called Securifi. My first run in with this device was when I came across the company’s Kickstarter page back in early 2013. I started drooling immediately, I mean with specs that included features such as 802.11 AC, Z-wave and a touchscreen who can blame me. The only problem I had with the device at the time was that as far as I knew it could very well be vaporware, which seems to be an ongoing issue with crowdsourced projects. I hesitated on backing the product for the $95 early bird price, BIG mistake. I received a notification around thanksgiving last year that my Almond was ready and only a year after my initial pre-order. To be fair to the company they had a lot of hurdles to jump over with problems ranging from hardware revisions to software glitches, which are to be expected when building a device from the ground up, they did overshoot their projected delivery date by several months though (sorry guys). ign of the Almond plus is very similar to its predecessor the Almond. It almost looks like a miniature rear projection picture frame. In the center of the all plastic body is the 3.5 inch touchscreen which is actually pretty decent and because its resistive its has a tactile feel when you press on it. The Ethernet ports are located on the rear of the device right next to the pair of USB 3.0 ports which should allow you to connect a mouse and keyboard and use the almond as a second PC, well not really, but they should allow you to connect some external storage devices to share your media over the network via the Almond’s built-in DLNA server. The only issue that I had with the device was that once the rear bracket was attached to the device it would reduce access to some of the ports, other than that the device would actually look good sitting on a desk or mounted to your wall. The Almond+ as the name suggests is an upgraded version of the companies existing Almond device which is actually highly rated on Amazon. What the Almond brings to the table is nothing short of astounding for its projected price of $249. You get a touchscreen which allows you to set the router up without the need for a PC. If you have ever had the headache of setting up a traditional router you will appreciate this add-on, Some other features touted by this jack of all trades are the premium Gigabit Ethernet ports which are significantly faster than the typical 10/100 ports found on most routers and support for the latest wireless standards, also present is Home Automation support with the integrated Z-wave and Zigbee interfaces. 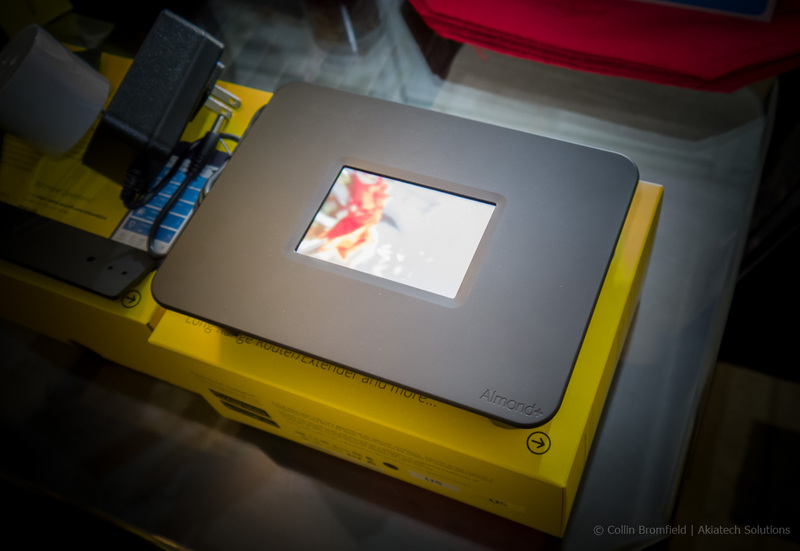 Almond+ has three main user interfaces, the first one is the touch screen that sits on the front of the router, the second interface is the browser admin interface which seems to be a custom skin for the third interface, the Linux based OpenWrt embedded Operating System. 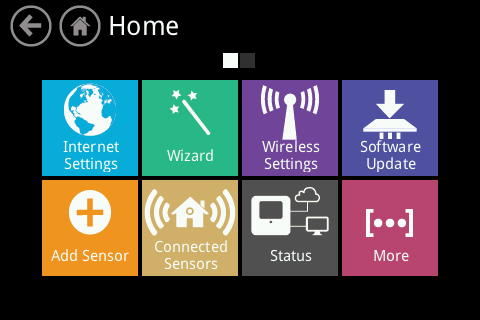 Each interface has its own special purpose. The touchscreen makes the Almonds advertised “3 minute setup” possible. Whether or not a first time user will actually be able to get the router configured in that amount of time is another question. It took me about 5 minutes to get a basic connection going. I was able to perform some basic testing by using a laptop equipped with an Intel Network 7260.HMWG WiFi Wireless-AC 7260 which was one of the first cards to be released with support for the 802.11ac standard. 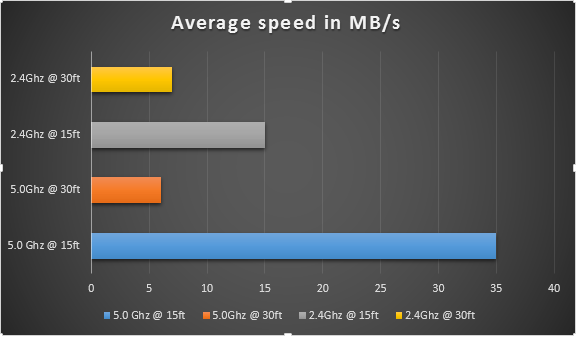 As you can see from the chart below the performance gain you get is significant when using the 5Ghz connection, while the 2.4Ghz band gives you similar performance that you would get from a Wireless N router. The performance seems on par with other ac routers, which is pretty good and a huge step up from the 300Mb devices that are being replaced. The range seems to be decent, I was able to get an okay signal at about 40ft away even though the router is hidden away in a cabinet which is not really optimal signal wise and not exactly practical for a touchscreen router but until I can find a new home for it that’s what I have to deal with. The best place for a router is in the center of all your devices and preferably within line of sight. Physical obstacles are not a wireless device’s friend and will kill the performance of your router, if you have no choice though, the almond can also double as a range extender so you can always buy a few more units to extend the range of your network. Even though the 3 minute setup time might be a huge selling point for the Almond’s intended demographic, if you are a more advanced user you may be in for a headache. I don’t have a typical home network. My network prior to the Almond consisted of 2 routers a switch and a server that handles my DHCP and DNS. This setup is more for learning than for actual practicality. When I bought the Almond it was only for two reasons, because I needed another ac router to replace the garbage D-link AC1200 router I bought in 2013 and for its Z-wave capabilities. I had specifically bought an enterprise level router that I wanted to reside on the edge of my network and the Almond was going to become an extension to that device. Well lets just say that the Almond+ does not like to play second fiddle. I could not get it to connect properly no matter how hard I tried. It would work properly if I used different IP ranges e.g. having my main network on 192.168.x.x but have the Almond’s DHCP server issue 10.0.x.x addresses to its clients. Where it failed completely was when I tried to have it pull the DHCP settings from my main router. I tried using it as an access point which seemed to work okay but then I could not access the configuration page anymore. I’m still new to the device so I will need to do more testing but the installation process for me was more like 3 hours vs the highly publicized 3 minutes, that being said my case is not typical and most people who purchase this device probably never come across this issue. Overall I think the device is a great addition to the market and the company has a proven track record with the original Almond selling like hotcakes on Amazon. I also know that this an early adopter device and is guaranteed to have problems. I’ve been following the Securifi and Kickstarter forums since this device was announced and I bought it as soon as I got the notification that it was available for purchase. For most people the Almond+ will be a huge upgrade to their current setups and they will no doubt appreciate the availability of such a device on the market. For the more advanced users the Almond+ does not disappoint with OpenWrt and a dual core processor running under the hood, except for a few glitches here and there whats not to love about this router? Some eye candy for you below and also a link to the Almond+ quickstart quide here.